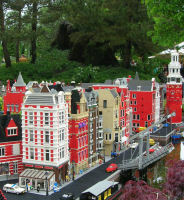 I visited Legoland in Billund, Denmark this weekend. As I do every year. A family tradition. Any in our family, who wants to go join us. This year one worked at Greenland Home Rule. One was busy writing a term paper at the University. One was at work making sure Telia survives in the cell phone market. The rest of the family joined our Legoland tour. Grandma paid. I go to Legoland for numerous of reasons. My children and their children love it. My children's spouses have to love it. I love it. My spouse has to love it. I had just talked to someone in Minneapolis about a sculpture. 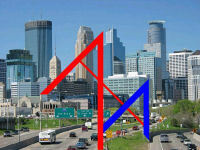 The "M" in Minneapolis. And I had talked to someone in Denmark about a sculpture in Kolding. 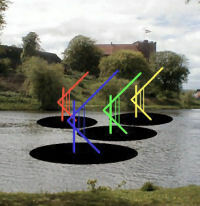 The sailing sculpture "4K" in Kolding Castle Lake. 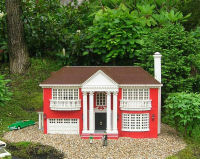 ...and all of this is built out of small bricks size 31 x 15,5 x 9,5 mm, that is 1.22 x 0.61 x 0.37 inches. Millions and millions of bricks. For the Bergen, Norway landscape there has been used 2.347.000 bricks. I hear a lot about children's needs. And the problems that arise if children's needs are ignored. Some have problems concerning self esteem. Some have problems concerning creativity. Some have problems concerning learning. Some have problems concerning social behavior. Some have problems concerning stimulation from grown ups. It's lack of psychological balance we talk about. Good old Maslow - Abraham Maslow - is known for establishing the theory of a hierarchy of needs. He says that the basic needs are physiological needs such as air, water, food, sleep etc. My theory is that Marslow forgot one basic need. LEGO. When children build with LEGO under the guidance of grown ups many of the above problems are avoided. Building with LEGO is building self esteem and self confidence. Their creativity is trained. They exercise playful learning. Building together with other children and grown ups improves their social skills. Building with LEGO bricks brings peace in the children's minds - at least for a while. One brick alone is...a brick. Two bricks combined in some way - you have created a sculpture. I'll show you how LEGO creates sculptures. They have an idea. They research. They design. They built. They exhibit. Like the creation of every other sculpture. I was invited to see the LEGO Studios. 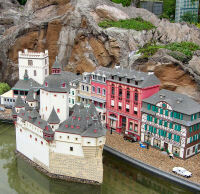 To the right you see Fredensborg Castle in the LEGO Studios. 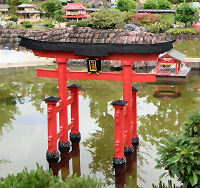 Ready to be placed in the Legoland park. Ready to be revealed by the Crown Princess Mary and the Crown Prince Frederik. Fredensborg Castle is the Crown Prince Couple's residence. The most amazing about the building of LEGO sculptures was a computer system, that transforms drawings into layers of LEGO bricks. This system makes everything much easier to the builders. The most disappointing thing was that inside the huge LEGO sculptures there were metal skeletons. Of course from an engineering point of view the skeletons have to be there. But. I have deleted this knowledge from my memory. It distracts my perception and fascination of the giraffe. Never ever tell this to the children. It's like telling them, that Santa Claus is just grandpa. You might be a parent, you might be a grandparent, or you might be a child. Let us build sculptures. 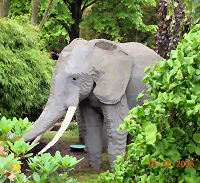 Build a model of a sculpture. Build whatever you would like with LEGO bricks in the colors you prefer. Photo the model. 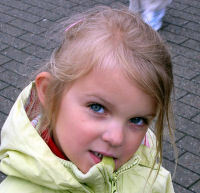 Send the photo attached to an e-mail to sculpture@mail.dk and I'll exhibit it on the world's largest online gallery, which is AbsoluteArts/WWAR - World Wide Arts Resources in Columbus, Ohio in USA. Our new art galley is called "Children's LEGO sculptures". See our art gallery logo to the right. 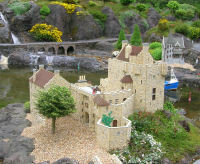 See the art gallery at http://galleries.absolutearts.com/galleries/lego-sculpture/. Tell me in the e-mail: What's the title of your sculpture? What's the height of your model in cm or inches? What's your name, address, country, age, gender? Where do you think it would be nice to place you sculpture? More...? At the same moment you send this e-mail you have become a sculptor. Hi sculptor...I mean you!!! if you enjoy working at your computer and if your computer is a sophisticated game computer, you might use LEGO Digital Designer, which allows you to create 3D LEGO models. You can make a virtual version of a real model, and then you can take a digital snapshot of your creation in .jepg and send it to the above e-mail address. Or you can exhibit it yourself. 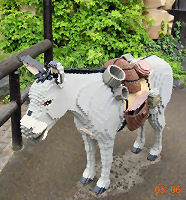 You can download LEGO Digital Designer here. Everybody who sends an e-mail to sculpture@mail.dk ought to have a prize. But. As it is custom to give prizes to a winner, here they are. 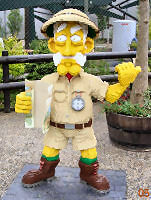 The owner of LEGO was Gottfred Kirk Christiansen. His wife, Edith Kirk Christiansen once visited Lille Fejringhus Galley. She saw the two silk-screen prints, 80 x 80 cm, numbered and signed, edition 125 shown above. And she burst out spontaneously: My goodness, that's LEGO colors. Sure, she was right. I had never before thought about, that I consequently use bright colors like LEGO. I made my first LEGO sculpture at an age of 3. Subconscious I might have picked the LEGO colors, when I want to communicate happy feelings. Another proof of LEGO's psychological power of penetration? I'll send these two silk-screen prints, 80 x 80 cm, numbered and signed, edition 125 to the winner. But. Maybe they a mostly for grown ups? Therefore I'll send 4 signed CIRCUS motifs 42 x 30 cm, edition 300, too. Still in LEGO colors!! The Clown, the Banana, the Parrot and the Clown's Shoe. I'll ask the present owner of LEGO, Kjeld Kirk Kristiansen, the son of Edith and Gottfred Kirk Christiansen if he would pick the winner, and I'll ask him if he might have some extra goodies for the winning sculptor. And now the very careful reader thinks I have made a misspelling. Kjeld's "K" in Kristiansen. It's not me, who have made a misspelling, but the misspelling is made by the clergyman, who wrote his birth certificate!! Of course children must play computer games, which are not more dangerous than chess. Of course children must have a cell phone, they have to communicate according to the trends of today. Of course children must have all the fancy toys. My theory is, however, that any caring parent and any caring grandparent must give their children and grandchildren a christening gift consisting of a considerable number of LEGO bricks in different colors. Not denying them a healthy psychological growth. Not denying them the joy of becoming a sculptor. This photo is from Singapore Airport. We landed in Singapore. We waited there for several hours for a delayed flight to Bangkok. Soon my son Jakob made friends with a Japanese boy and a girl. Their common language was LEGO.